“I’m living on the edge man. Dancing on the head of a pin. Because at this moment, it’s like I’m cutting myself right down to the bone and I’m scared to get to the marrow.” Those were the words I wrote hastily on my scrappy piece of paper, in a tiny yet luxurious studio apartment on Sloane avenue in London. I was in fact stripped down to my underwear pacing the room for 56 of the 72 hours I had to myself. I was sweating bullets. I was clawing at the bottom of my barrel of good ideas. Why? Because on Monday a new draft of my play was expected for a reading for the whole of the Royal Court Producing team. Famous British actors were going to read it. But more importantly, I was digging deep into some difficult, personal truths. The page was calling for it. And I was scared. You do not know what wars are going on down there where the flesh meets the bone, says the poet songwriter Lucinda Williams. But let’s back up a moment, before I get all spiritual on you. A long time ago, in that far away country called 2013, I was invited to join in the British council’s writer’s program. I met all of the great new writers listed here in Play Riot there for the first time. 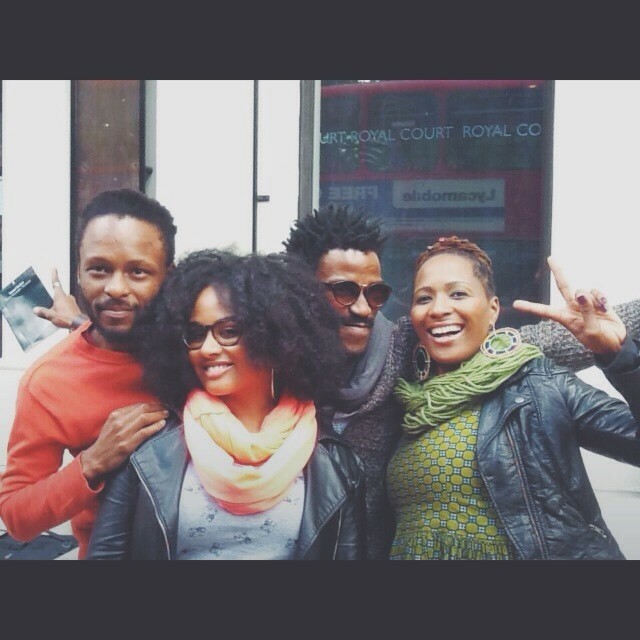 Of course we mostly knew each other from the SA theatre circuit or had heard of each other via a friend of a friend. But we were all there to develop a new play. 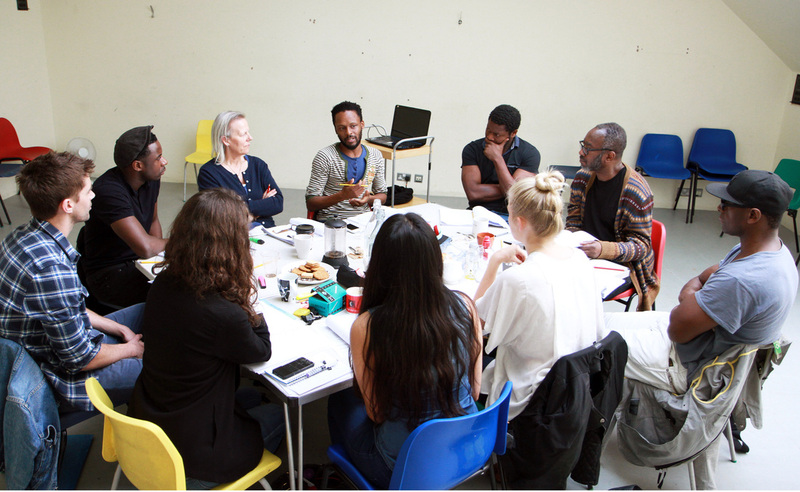 Elyse Dodgson (International director at the Royal Court), Winsome Pinnock and Leo Butler, two talented and respected writers in Britain, came to work with us. Over the course of a year and a half, 3 workshops and lots of red wine, we toiled at our laptops to create 11 plays worthy of production. Seriously. It was a long process. I’ve back problems to prove it. Earlier this year, the Royal Court realized that 2014 marked 20 years of South African Democracy and they were in possession of 11 writers who were penning modern stories about what it’s like to be a South African today. 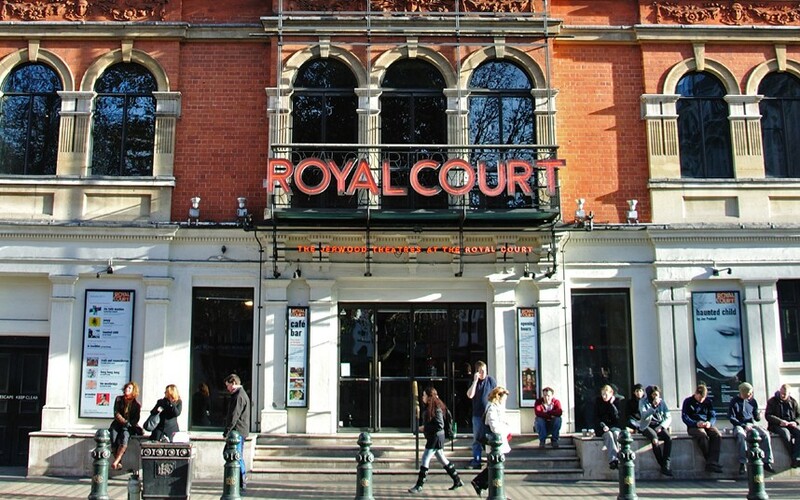 So in May, 6 of the completed plays (complete drafts) were staged at the Royal Court. Full Readings. With professional actors. And a dedicated director. You get it? They dedicated the time and energy of a team of established artists to just work on reading the plays at a public gathering, where the audience paid good money to hear them. And it was an incredible week. The diversity of stories outlining the different experiences of modern South Africa was enlightening for me, let alone the British audiences. I was inspired by Napo Masheane’s poetic vision of the women who raised this country to mature into a modern democracy and Simo Majola’s fathers who are scarred by struggles they encountered, so that their sons may walk free. I was unearthed by Amy Jeptha’s memories of a child playing amongst the rubble & memories of her childhood home and empowered to shatter the gates of poverty alongside Omphile Molusi’s poet magician Wilfred. And I travelled the psychic shores of Neil Coppen’s work, where he fused memory and forgetting with love and culture in a psychodrama about modern love and young men. The week was an extraordinary experience, revealing that there are indeed plenty of stories and talented writers in South Africa. Did I mention Professor Snape was there? And by Severus, I mean Alan Rickman! If you don’t know him, I’ll cut your heart out with a spoon! Come on nineties children, you know what movie I’m referencing. I also took a selfie with Benedict Cumberbach. So many memories. So many influences that brought me to this place, on a crisp November weekend, pacing the length of a hotel apartment on Sloane street, at the cross road of flesh and bone. 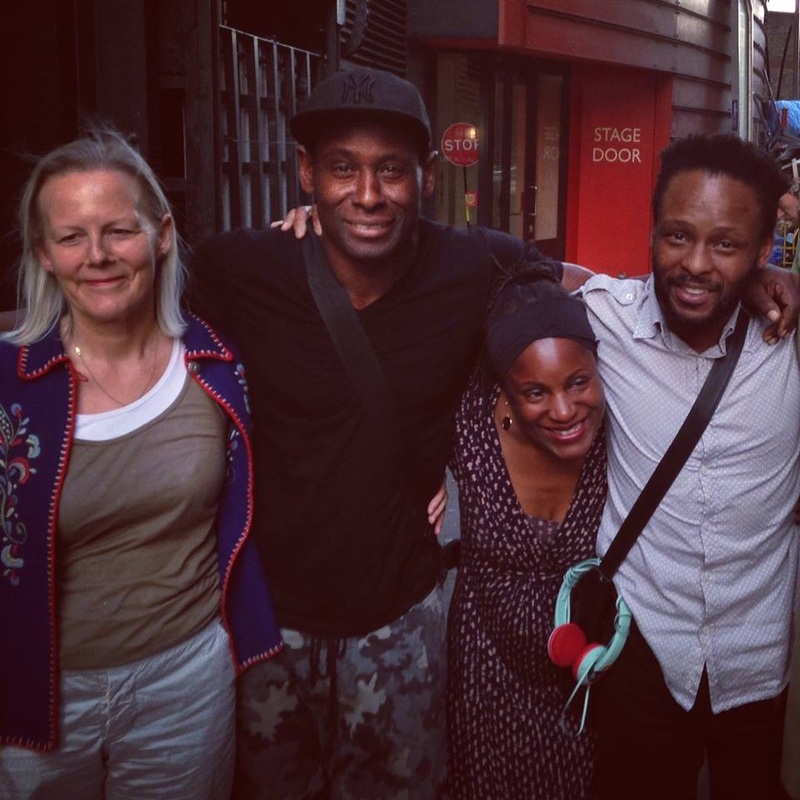 But the most powerful relationship of this experience has been my director and mentor, Phyllida Lloyd. We have a hard time in the arts, here in South Africa. We try to do everything ourselves. Write, direct, act, produce, market, fund. It’s a rare show where one is not fulfilling all of these roles. So when I sat down with Phyllida for a coffee and a chat about the play, I felt a release. I was expected to just be the writer. I was freed from other responsibilities. I was respected for the role I played in the process. I was a part of something. I was the writer of the play. The struggle around this latest draft of Brave, was all about letting go of the lead character. Just as I learnt to let go of wearing all the roles needed to get a production off the ground, I had to learn to let go of the personal experiences that inspired my play. I had to let Ben & Buthelezi, the two lead characters, be who they wanted to be. At the crossroads of flesh and bone I surrendered myself to the will of the story. Did the team and I get to the marrow of the story? We’re close. Close enough to want to get this play on stage. To get in the room with the actors, and other technical artists and move into the next draft. It all comes down to collaboration, the sharing of gifts. So many people have already given to this play, to me, the writer. My thanks. To paraphrase Ursula Le Guin, a writer needs all the help they can get. To have the time to ponder on a pin, dance dangerously close to the edge. To have receptive ears. We have to launch something beautiful and watch it crash and burn. You have to keep at it, whether by your own will and herded there by great mentors. We have to learn to let go of control, when the work is taken in by others and begins to fly farther than we ever planned to places we’ve never been. So few of us have been given such chances in South Africa. And it’s easy to believe it’ll never come. But it does. We just have to work hard and carefully and wait patiently for such experiences to finally occur.